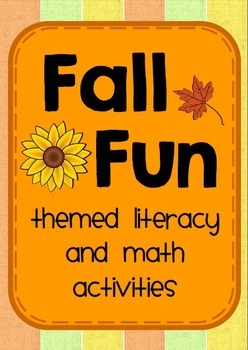 This pack includes ten Fall-themed activities - five ELA activities and five Math activities. 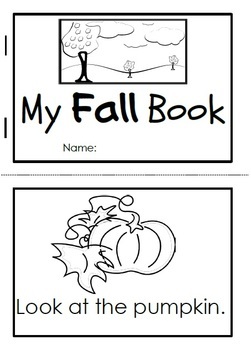 Fall book - Students create their own 6-page Fall-themed book by completing the sentence "look at the..."
Letter Scramble - Students will use the letters from a Fall-related word to create as many smaller words as possible. Word Wall Words - Display these on your classroom word wall. Alphabet Flashcards - Includes a set of upper-case and lower-case letters. Missing Letters - Students practice writing the letters in alphabetical order by filling in the missing letters. Includes upper-case and lower-case on two separate pages. 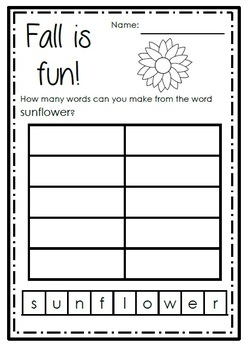 Tens Frames - Includes filled frames for all numbers 0-10 and a blank frame with separate counters to print. Roll, Add, Color - Students roll two dice and add the numbers rolled. They then locate the total on a leaf and color that leaf. Missing Numbers - Students write the missing numbers in the appropriate spaces. Includes 1-10 and 1-20 on separate pages. Number Maze - Students practice counting to complete the maze. Includes 1-10, 1-15 and 1-20 on separate pages. 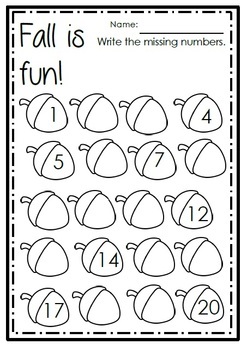 Number Flashcards - Includes numbers 0-20 and picture cards to allow students to match numeral to image.